Exciting news for capitalism was the recent achievement of trillion-dollar value for both Amazon and Apple, making them the first corporations to obtain such a lofty status. 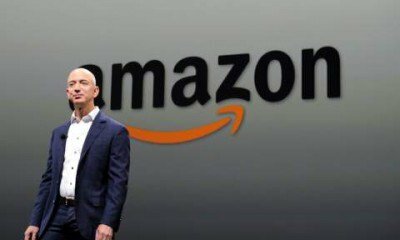 Amazon’s skyrocketing growth makes its CEO, Jeff Bezos, the world’s richest person with a $160 billion net worth. 30 Sep 2018 – Driving the engine of global wealth concentration are giant transnational investment management firms. In 2017, seventeen trillion-dollar investment companies collectively controlled $41.1 trillion of capital. These firms are all directly invested in each other, making them a huge cluster of centralized capital managed by just 199 people, who decide how and where that wealth will be invested. In the case of Amazon, the top investment management corporations are: Vanguard $56.7 billion, BlackRock $49.5 billion, FMR $33 billion, Capital $33 billion, State Street $29 billion, and most of the other trillion-dollar Giants and many others who hold 58.6% of Amazon shares. So, while Bezos is a large tree in the forest, the forest itself is groomed by a few hundred global power elites making investment decisions that drive the concentration of wealth into coffers of the 1%. These elites interact through non-governmental policy-making organizations—privately funded by large corporations—that include the Council of Thirty, Trilateral Commission, and the Atlantic Council. Their role is to facilitate, manage, and protect the free flow of global capital. They do this by providing policy recommendations and instructions to governments, intelligence services, security forces, NATO, the Pentagon, and transnational governmental groups including the G-7 G-20, World Bank, IMF, and International Bank of Settlements. The biggest problem global power elite investors face is that they have more capital than there are safe investment opportunities, which leads to risky speculative investments, permanent war spending, and the privatization of the public commons. The world’s total wealth is estimated to be close to $255 trillion, with the United States and Europe holding approximately two-thirds of that total; meanwhile, 80 percent of the world’s people live on less than $10 per day, the poorest half of the global population lives on less than $2.50 per day, and more than 1.3 billion people live on only $1.25 per day. 795 million people on the planet are suffering from chronic hunger, according to the United Nations World Food Program. Each year, poor nutrition kills 3.1 million children under the age of five. Each day 25,000-30,000 people die from starvation or malnutrition, a staggering total of more than ten million such fatalities each year. Chronic hunger is mostly a problem of distribution, as one third of all food produced in the world is wasted and lost. So, while the global power elite can manifest a Bezos, they cannot or will not address the crisis of inequality and mass death in the world today. In 2017, 2.3 million new millionaires were created, bringing the total number of millionaires around the globe to more than 36 million. These millionaires represent 0.7 percent of the world’s population and they control more than 47% of global wealth. At the same time, the world’s bottom 70 percent only control 2.7% of the total wealth. The danger is that global power elites will fail to recognize the inevitability of economic and/or environmental collapse before making the necessary adjustments to prevent millions of deaths and massive civil unrest. Without significant corrective adjustments by the global power elites, mass social movements and rebellions, coupled with environmental collapse, will inevitably lead to global chaos and widespread war. We must institute a simple guiding principle of thinking of the future of our grandchildren and their grandchildren when making decisions about the use of global capital resources. Seventy years ago, after World War II ended, people throughout the world were motivated to find ways to permanently prevent such terrible bloodshed from ever again taking place. As the United Nations was forming, a Commission on the moral principles necessary for sustainable peace, made up of eighteen nations, met at Hunter College in New York City in 1946. They began what two years later would become the Universal Declaration of Human Rights, approved unanimously by the United Nations in December 1948. The Universal Declaration of Human Rights is a document that social movements can easily adopt as a statement of moral principles for actions of resistance to wealth concentration and global inequality. It is equally important as a document of principles for the global power elite to use as a guide for corrective actions needed in the world today. It is no longer acceptable to believe that global power elites can manage capitalism to grow its way out of the gross inequalities we all now face. The environment cannot accept more pollution and waste, and civil unrest is inevitable. We need to pressure global capital elites to step up and insure that trickle-down becomes a river of resources that reaches every child, every family, and all human beings. These changes are required for nothing less than humanity’s long-term survival. 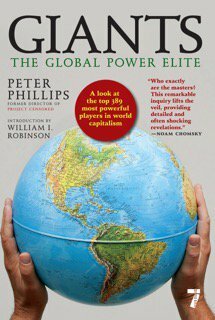 Peter Phillips is a professor of political sociology at Sonoma State University, where he has taught since 1994. He teaches courses in Political Sociology, Sociology of Power, Sociology of Media, Sociology of Conspiracies, and Investigative Sociology. He served as director of Project Censored from 1996 to 2010 and as president of Media Freedom Foundation from 2003 to 2017. He is Research Associate of the Centre for Research on Globalization.